For documentaries seeking theatrical distribution in a crowded marketplace, a premiere at a major film festival is still the primary way to generate buzz. All six films nominated for Best Feature at the 2016 IDA Documentary Awards premiered at a major festival, although two of them arrived there with a distribution deal in place. But many successful docs follow a different path, whether by choice or circumstance. This case study will focus on one such example. 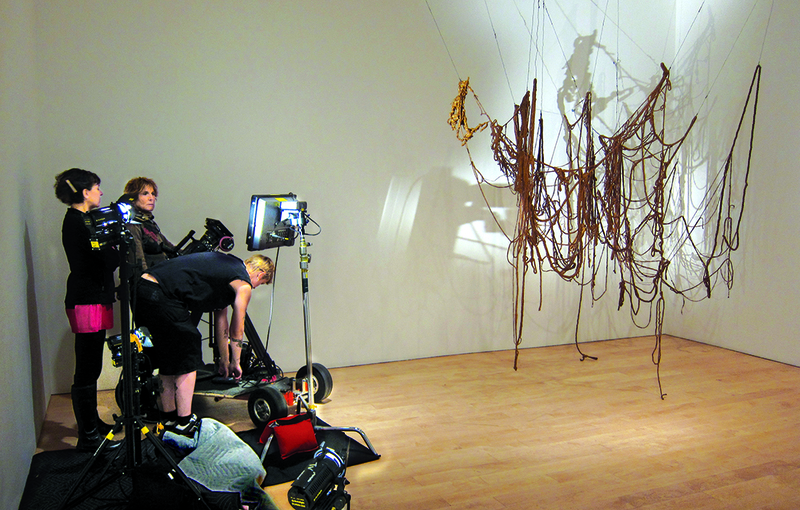 When their film was passed over by certain international film festivals, the team behind 2016's critically acclaimed biographical documentary Eva Hesse implemented an unorthodox distribution strategy, one customized to the unique appeal of their project's subject matter. Documentary met with director Marcie Begleiter and producer Karen Shapiro at their Santa Monica office to discuss their plan for getting Eva Hesse in front of audiences. Hesse is an ideal documentary subject: highly regarded but not widely known. She was a complicated, challenging, powerfully idiosyncratic modern artist with a dramatic life story. Hesse fled Nazi Germany at age two in a Kindertransport; later, after settling with her family in New York, she became a Lower Manhattan proto-feminist sculptor who broke with the Minimalism of her male contemporaries; and after a brief, ten-year career, which included a return to Germany, she died in 1970 of a brain tumor. Crucially, this revolutionary post-war artist had not yet been the subject of a feature film. Within the art world, Hesse is an icon, but outside of it she remains obscure. A designer, production illustrator and professor, Begleiter has spent years researching Hesse's art and life. She wrote a play called Meditations: Eva Hesse, and staged it in Santa Monica in 2010. When Shapiro saw Meditations, she encouraged Begleiter to take Hesse's story to a bigger venue. 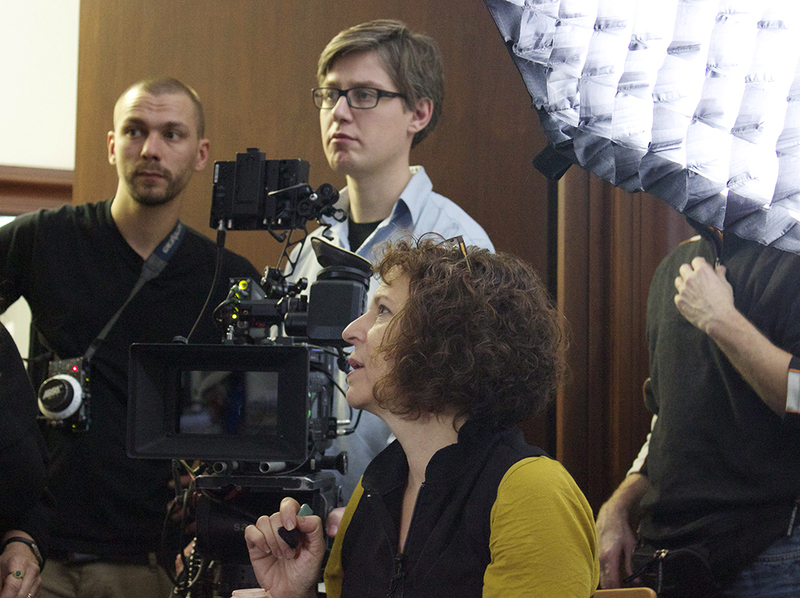 "For most filmmakers, the hardest part of making a film is the production," says Shapiro. "To me, the hardest part of making a movie is getting it out in the world. That's one thing that filmmakers could really benefit from knowing before they even start making their film: Who is the audience?" Begleiter and Shapiro sensed that their film would benefit from the intense, cultish fascination surrounding Hesse's work. They established an online presence for the Hesse film project early on, with a website and Facebook page that offered updates on research, funding and other developments. "During production and post-production, we were already engaged in developing an audience," Begleiter points out. The filmmakers supplemented their online outreach with live events to introduce the still-in-progress film to a network of curators, artists and tastemakers. In 2014, the team held a New York gallery event that was attended by Adam Weinberg, the director of the Whitney Museum. As a result, he invited Eva Hesse to be the first film to play at the new Whitney—an ideal match of subject and location. The Whitney screening, in May 2015, was the film's US premiere—though not necessarily by design. "We wanted a theatrical run, " Begleiter explains. "We knew we would get the museum run. We knew it would have a long life in educational. It was really Karen's vision, because I came into this and it was my first time up as writer and director. She led the battle cry on it." "We had a first-class cinematographer [Nancy Schreiber]," Shapiro recalls. "We had a first-class editor [Azin Samari]. We convinced the German co-producer [Michael Aust] to do 5.1 sound. The mission was theatrical distribution." The filmmakers wanted Eva Hesse to be taken seriously as a work of cinematic art, and not as a visual encyclopedia entry about the artist; it's a difficult hurdle for many artist-centered docs to overcome. When film critic A.O. Scott raved about Eva Hesse in The New York Times, designating it as a "Critics' Pick," he also likened the film to "a comprehensive exhibition catalog or a thorough critical essay." "It's important to us that people have the experience of the film in a big dark room with other people," Begleiter says. "There is something else that happens in that experience, and you want your work to be seen in the best possible way. They are committed to that and quite frankly, not everybody is anymore. It's not easy; it's a lot of work." Before the Whitney premiere, they approached Nancy Gerstman and Emily Russo of the New York-based distribution company Zeitgeist Films, whose impressive back catalog and track record with art docs includes hits like Bill Cunningham: New York and Ballets Russes. "They know the landscape," Begleiter notes. "And they are committed to theatrical…[and] willing to do the work to keep this film in theaters." Zeitgeist came to the Whitney screening as an interested party, and they signed on as the US distributor shortly afterward. "We also got an offer at the Whitney screening from Karen Cooper at Film Forum [the downtown New York three-screen theater that has been very hospitable to arts documentaries]," Begleiter adds. "Out of the Whitney we knew we had our theatrical." After the Whitney screening, the team also launched a Kickstarter campaign. "We still had bills to be paid to really be able to distribute the film," Shapiro notes. "We went in with a goal we thought we could achieve, but it wasn't just about the money. It was about the outreach. We wanted to reach those people who we might not reach any other way. It was hugely successful in that regard." Thanks to positive reviews in The New York Times and The Wall Street Journal, they sold out many screenings at Film Forum when they opened last spring. According to Begleiter, "The second week of the run was even higher than the first week. Usually it goes down. We were there the first week and doing great business. Then we leave [New York] and it's the second week and we expect there to be a drop…but there was more." Good timing enabled them to pair the theatrical release with the interactive "Eva Hesse Around Manhattan" project, which pointed moviegoers toward several current local exhibitions showing Hesse's work. "This was amazing," Shapiro says. "We picked a release date before Zeitgeist was on board. We knew we wanted the spring and it was one of the last dates [Film Forum] had available. Little did we know that Hesse would be in all of these venues at the same time." "Total coincidence," Begleiter says. "We just called everybody up and said, ‘What have you got? Do you have any Hesses on view?' For instance, the Museum of Modern Art, they don't always have their Hesses out. It just so happened they were opening a show of their collection [of works from] 1960 to '69, and they had two really important Hesse works, which we actually deal with in the film. So MoMA was on, the Drawing Center was on, and there were five or six others." Begleiter and Shapiro have remained fully engaged with marketing throughout the film's life cycle. According to Shapiro, "Part of the reason to have a Zeitgeist is that we don't have to focus nationally on the nuts and bolts of [distribution]; they handle that. If we had to do all of that, we wouldn't have the time or the energy to do all the marketing we do. It takes a team. You can't do everything yourself." Zeitgeist also holds the film's digital rights, and the filmmakers expect Eva Hesse to end up on one of the major SVOD platforms. Though DVDs are no longer de rigeur, Begleiter and Shapiro are creating one with special features that can be sold in art museums and to libraries. The film, which has grossed $200,000 to date, currently has theatrical bookings through April 2017. It will likely arrive on home video the same month, a full year after its initial Film Forum opening. "The theatrical is going so well that we don't want to release any of that until it has played its course," Shapiro says. "We want as many people as possible to see it in theaters." In the long tail, educational distribution may become the biggest source of revenue for Eva Hesse. Begleiter has taught in art schools and film school for 15 years, and is traveling the country to ensure the film is adopted into college curricula. Still, the filmmakers remain adamant that the theatrical release was paramount. "Our vision was not just for the art world," Begleiter maintains. Hesse was "this multifaceted, really interesting artist who was a woman who also lived through this extraordinary moment in the 20th Century…coming out of Germany the way she did, having to go back to Germany to find herself. It's a great story." SAMO IS DEAD: Long Live Basquiat!